A definite Fashion Statement Infiniti Scarf. A winter accessory must have, when you want to receive numerous compliments! Infinity scarf cowl super chunky and squishy, handmade crochet in mushroom (light tan) in the popular Exclusive Super Chunky 2 Sisters Handmade Design. DOUBLE strands of super bulky yarn are used to make this eternity scarf thicker, warmer and super chunky & squishy. The size is about 5 - 5.5" inches wide and 48 - 50" inches in one continuous loop. There is a slight 1/2 inch stitch variation (seam) where each row is joined. 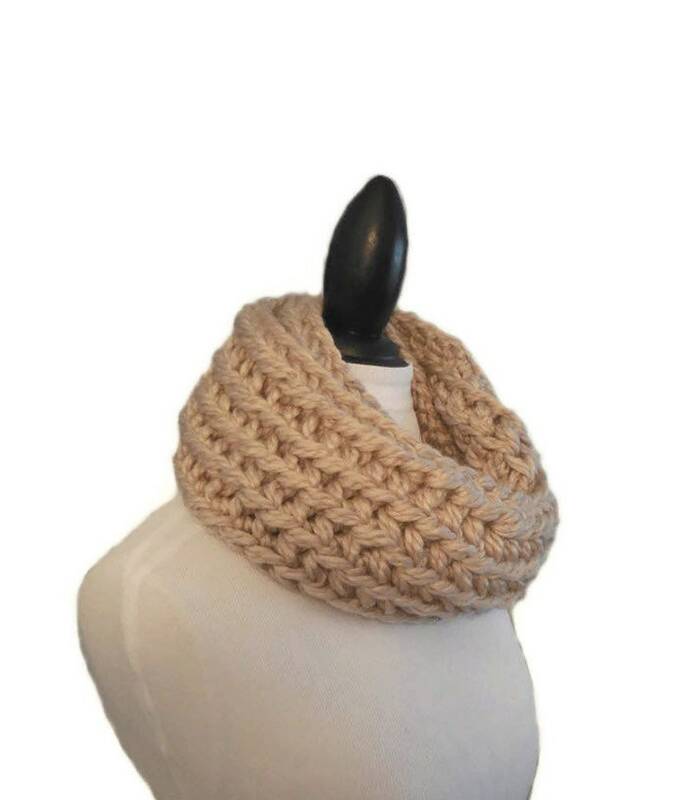 It looks excellent as a long circle scarf or loop it for a Fashion Statement in an EXTRA Chunky cowl. The scarf is made with the 5 Star Rated super bulky Wool Blend Yarn - 50% Wool / 50% Acrylic. CARE: Hand wash and lay it flat to dry -- you may also wish to wrap it in a towel before laying it flat to dry to absorb some of the water.